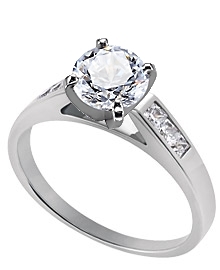 This pretty 14k white gold cathedral style engagement ring is channel set with 6 - .05 carat princess diamonds having a color of G-H and a clarity of SI. Three princess stones are set on each side of the center diamond for a total weight of .30 carat. You choose your center diamond from our inventory.